Whether you’re having a pre-wedding engagement session, visiting London for a fun holiday or are just looking for some awesome photos of you and your partner. Engagement photography (or a couple session) is a great way to get some amazing photos that highlight what makes your relationship unique and awesome. They’re also a lot of fun and a cool way to discover more of London. My goal during an engagement shoot is to capture those moments that occur between you which are unique to your relationship while also showing off London’s awesomeness. I do this using creative and fun photographic techniques. Do you feel uncomfortable in front of the camera? Well, so do I. As do the majority of my couples. I purposefully keep my approach relaxed and casual to help you feel at ease. If you’re extra nervous we could start off with a quick coffee or pint down the pub. What does an engagement shoot look like? We’d meet up in a fun London location and spend 1.5 hours messing around and having fun with the camera. If there is a location that has sentimental value, then let me know. I love shooting at locations that have a story behind them. In the past with my couples we’ve shot in a huge range of locations from living rooms to parks and urban skate parks to lavender fields. 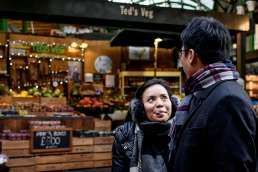 I recently wrote an article on my favourite spots in London for engagement shoots. "After seeing the pictures, we could not be happier. They are absolutely stunning. They captured our personalities perfectly. Matt has a great eye and we ended up with gorgeous photos. His pictures were exactly what we were looking for! I could not recommend him more highly." What’s included in your Engagement Session? A fun and relaxed 1.5 hour session messing around in your favourite parts of London. I'm always happy to recommend some cool locations. Want to make your own album or prints or do something a little alternative with your images? No problem. You will receive 50+ photos with a licence for unlimited personal use. PLANNING TO PROPOSE TO YOUR PARTNER? "Matt is an extremely natural and talented photographer, giving us little instruction, he wanted us to feel at ease, capturing candid photos - making them seem so 'us' and not rehearsed or phony." Still have some questions about your engagement shoot? What locations would you recommend for our shoot? London has so many awesome places where we could do your shoot and I’d be happy to recommend some based on your characters/interests and what you’re looking for. I recently wrote an article on my favourite London locations which might provide some ideas. First though, it’d be great to know of there were any specific locations you’d like to do the shoot. Maybe somewhere that has meaning to you or somewhere you enjoy hanging out as a couple. What would you recommend we wear? Wear something that you feel comfortable in. For example, wear shoes that you’re happy to walk around in for a couple of hours and if it’s cold, wrap up warm. If you feel uncomfortable during the shoot, not only will it not be as fun but it may also show in the photos. So that your clothes don’t distract too much from you in the photos, try to avoid, crazy patterns, big logos and too much white (it reflects the light so appears very bright in photos). Do we have to be engaged? Of course not! Although called engagement shoots, they are open to anyone. So whether you’re newly in love or celebrating your 20th wedding anniversary, a shoot is a great way to celebrate your love in an awesome city. These shoots have proven especially popular with fun loving couples visiting London on holiday from all over the world. What if myself or my partner are uncomfortable in front of the camera? When is the best time to do an engagement shoot? The best light is found in the 2 hours after sunrise or 2 hours before sunset. This is when you get softer light with that lovely golden glow (the reason the hour before sunset is sometimes referred to as the ‘golden hour). Mornings (if don’t mind the early start) have the added bonus of smaller crowds, compared to afternoon/evening shoots. London has a bit of an unfair reputation when it comes to rain. Yes it may be cloudy most of the time but it doesn’t rain as much as you may think. And when it does rain it usually doesn’t last that long. But if we do get hit with more rain than expected then we can have fun with some awesome covered locations (e.g. Borough Market and Leadenhall Market) and umbrella/rain action. Dependent on my availability I’m also happy to move the shoot by a few hours or a day. How long after our shoot will we receive our photos? You’ll receive your photos within 5-10 working days after the shoot in your private online gallery. Do you do shoots outside of London? Please note that in these cases I do charge extra to cover expenses and my extra time. "Matt simply let us be ourselves in front the camera - very little excessive direction or posing and no cheesy props - giving us exactly what I was hoping for, which was very high quality photos with my fiancée in some of our favorite places in London." 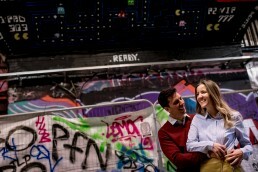 Think I’d be the perfect fit to photograph your London Engagement Shoot? I’d love to hear from you!